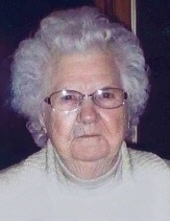 Vera M. Erickson, age 93, of Tomahawk, WI, passed away on Monday, April 8, 2019, at Country Terrace Assisted Living. Vera was born in Tomahawk on May 15, 1925, to the late Evan and Minnie (Morgenroth) Hoff, Sr. She was married to Philip Erickson on May 22, 1948; he passed away in 2001. Vera was a 1943 graduate of Tomahawk High School. After graduation, she moved to Merrill, WI, where she lived until the passing of her husband. In 2003, she moved back to Tomahawk. Vera was a stay-at-home mom and took care of children. She always had a house full of kids. Wherever she lived, even in her later years, children always found their way to Vera’s. She enjoyed flowers, fishing, bird watching, reading, crossword puzzles, and knitting. In the summer, she loved going to rummage sales. Vera loved her trailer on the Somo River and spending time with her grandsons, “the boys”, Derik and Christopher. 1 Brother, Evan Hoff, Jr., of Tomahawk. Vera was preceded in death by her Parents, Evan and Minnie; her Husband, Philip; 2 Brothers, Melvin Hoff, and Howard Hoff; 2 Sisters, Marion Whiting, and Shirley Alft; 5 Sisters-in-Law, Edith Erickson, Vivian Erickson, Grace Radloff, Evelyn Emerich, and Jeanette Erickson. Memorial Service for Vera Erickson will be held on Monday, April 15, 2019, at 5:00 PM, at Generations Funeral Home. Rev. Mark Ziemer will officiate. The family will receive friends for Visitation from 4:00 PM until the time of Services at 5:00 PM. Memorials are appreciated to the Salvation Army Happy Kids Backpack Program. To send flowers or a remembrance gift to the family of Vera M. Erickson, please visit our Tribute Store. Salvation Army of Tomahawk "Happy Kids Backpack Program"
"Email Address" would like to share the life celebration of Vera M. Erickson. Click on the "link" to go to share a favorite memory or leave a condolence message for the family.